New York: D. D. Smith, 1805. First Edition. Hardcover. Lacking the endpapers; small chip at the top of the spine. A clean, attractive, unsophisticated copy in original binding of a scarce and important book. Twentyfourmo (3-3/8" x 5-3/8") bound in original full sheep leather with gilt rules on the spine; 180 pages. The second American cookbook, preceded by Amelia Simmons's much better known AMERICAN COOKERY, printed four times before the publication of this volume, which is much scarcer than the Simmons. 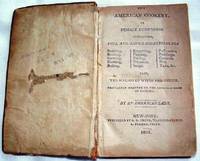 It is also distinguished as the first American cookbook published in New York. In addition to the recipes for broiling, hashing, preserving, pickling, fricasees, soups, puddings, pies, etc., there are 20 pages devoted to the making of wine, quite early for an American book. Bitting page 581: "There are some unusual recipes, one for spinach, a forerunner for the spinach of today, cooking with no added water, garnished with poached eggs, and unusual for that period; oranges cut in quarters." Lowenstein 36 cites another New York imprint of T. B. Jansen in the same year.